timeline sharing your amazing photos from the night! Prints are a thing of the past at OMG! and we now offer the last trend in technology. The perfect addition to those corporate events or functions where your guests are incredibly social. Keep your social media page up to date with photos taken on our Social Media Selfie Pods. Guests can choose their photos on our pods and instantly upload to their email, Facebook or Twitter. 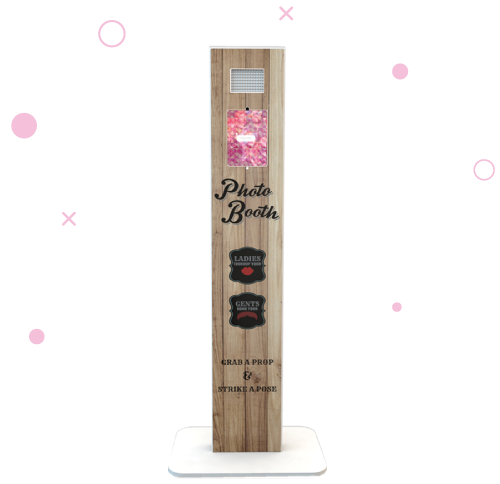 Our iPad photo booths are usually seen in London for corporate events, as mentioned. We can make bespoke every photo with custom logos and branding. This fits well for weddings, too! Have an idea of a logo that you’d like on the photos? We’ll design this in-house to bespoke your evening. What a great way to show off a memorable event. If you’re looking for GIF pods, we also can tweak our software to allow users to take four photos that are presented in a GIF format. Get in touch with the OMG team to find out how these new pieces of equipment can be completely modified to offer you exactly what you’re looking for. Our Social Media Upload Pods are a great addition to retail stores, corporate events, Christmas parties and most other events that require that additional spark of entertainment. We can fully brand the social pod to have corporate wrapping or we can bring along our standard pattern of vintage wood. Whatever your needs for our social pod, we can help so, don’t hesitate to pick up the phone and ask one of the friendly OMG! team how you can have one of the most popular crazes at your event! To find out more information about our open air social photo booths, contact the OMG! Team on 0800 234 3447 or send us an enquiry using the form below! – Choice of photo layout – 1 shot, 3 shots or 4 shots & GIF mode. Our amazing Social pods bring a real social experience to your evening and really give the event that WOW factor. It uses one of the latest 9.7inch iPad Pro’s which come unrivaled when it comes to photo taking quality and speed! whether it’s a wedding, corporate or your just organizing a party the OMG! Social Pod will not disappoint your guests with the amount of customizable options it has to offer!